Deeply moved by the gift that the Japanese have given to the world in regards to wood technology, Fierro, who grew up the son of an artist, completed a five-year Japanese-style woodworking apprenticeship and has taken this refined approach to new heights on the island of Maui. Attracting a team of the finest woodworkers on the island, Fierro is now one of the top woodworking manufacturers in the region. Utilizing millworking machinery and traditional Japanese handtools, Fierro’s team creates a wide array of “functional sculpture” : Full wood interiors, staircases, windows, doors, teahouses, meditation huts, pavilions, shoji, furniture, lamps, furo (cedar soaking tubs), and an assortment of architectural details; all are intended to develop that deliciously rich characteristic of time and usage: wabi-sabi. This element of beauty found in the aging sheen of patina amplifies the understated and refined aesthetic Fierro and his team employ in architectural magnificence beyond words. I create furniture that highlights the natural beauty of wood itself. I believe in crafting pieces that are not only visually stunning, but also highly functional, so that your piece of artwork can be integrated into your daily life, with a level of quality worthy of handing down for generations. Creating works of art that you will treasure is passion. Over the twenty years of experience I have gained, I have come to cherish the wood itself as the major design element, nature as my inspiration and my relationships with my clients as the core of my business. Shaun Fleming has made her own way, spending hours, days, and years honing the physical requirements and mental discipline demanded to be a premier artist in her craft. Prized by discerning collectors throughout the world, Shaun's pieces contain an organic strength and careful balance between the durable and the ephemeral. They are sturdy and built to greet generations to come, yet imbued with the impermanent grace of flowers, wings and butterflies. Fine woodworking and design on Maui for over a decade. Uncompromised quality and unbounded design. 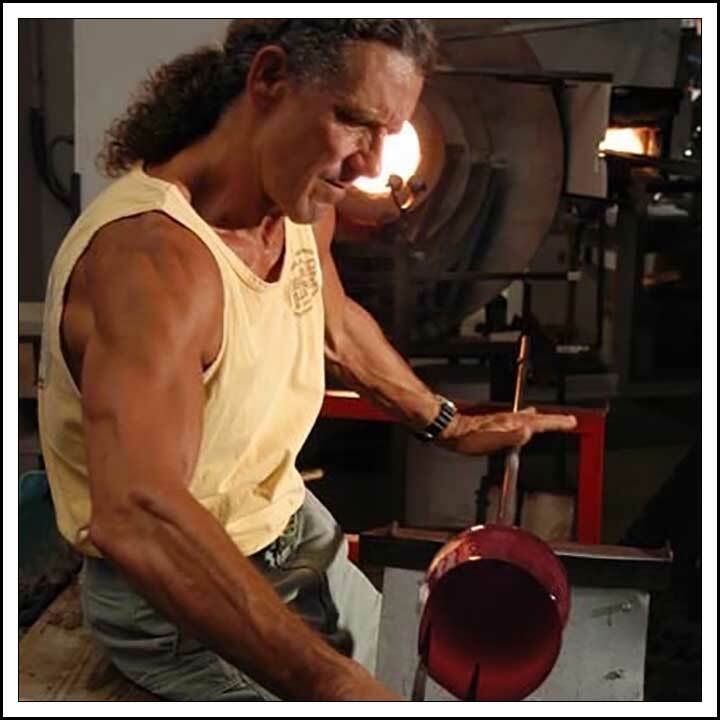 Thomas takes pride in his superior craftmanship and ability to create custom designs. Commissions welcome. Custom made wood cabinetry, furniture, and carved doors created using exotic and local woods by renowned woodworker and artist Clay Simpson. Located in Kula, please visit our website or send an email to connect. I do all facets of custom artistic glass blowing. My specialty is lighting, chandeliers, wall sconces, pendants and table top accessories. I also create glass ceilings, sculptures, and architectural elements. My clientele includes Harrah's Casino, Parx Casino, Mandalay Bay Casino, Hard Rock Casinos, and a myriad of corporate, public and private entities. Now celebrating 55 years in glass I am always seeking new custom opportunities on residential, restaurants, or hospitality and health care venues. Please visit my web site and let me know how I can help you and or your clients enjoy the magic of my creative glasswork.